It was the winter of 2013 and everyone was facing very harsh weather conditions in the USA, but Ford engineers were busy in making a highly anticipated muscle car. Yes! It is the Ford Mustang 2015. The redesigned pony arrived with colossal advances over its predecessors to take back the road supremacy. It has an improved and independent rear suspension, revised interior and retuned engine. All these changes give a red signal to Chevrolet Camaro. All new 2015 Ford Mustang has a brand new 2.3 Litre Ford EcoBoost engine with four burners. The Mustang has also received a much-needed high-performance version to replace old Shelby and inject some young blood into its veins. The much hyped GT350 will take the charge to the Camaro Z. A naturally aspirated, 5.2 litre V8 is expected to motivate the GT350R. This new engine will churn out 520 horsepower with 460 lb-ft of torque. The reduction in weight means it hits the 60 miles per hour in just under four seconds. It will be offered in six-speed manual transmissions alongside Torsen limited slip differential configuration. 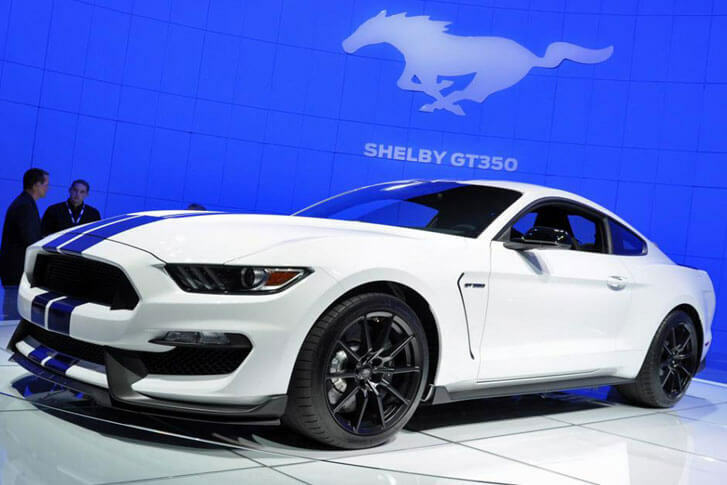 According to the sources, all new GT350 will arrive soon, possibly at 2015 Detroit Auto Show. However, the GT350 is on the lookout for the Chevrolet Camaro z/28 because it can give the Mustang a run for its money. It is a track capable car, powered by a naturally aspirated 7.0 litre V8 with 505 horsepower and 481 lb-ft of torque. It hits the 60 miles per hour mark in 3.8 seconds with a six-speed manual gearbox. On the basis of power, the competition is very tough, but Mustang still has an edge of being a bit powerful, even with a smaller engine and lightweight body. Let’s see, what happens when these two face each other in the epic battle of battles.